Here is my proposal for sorting much, much faster than quicksort. All the algorithms must be checked with different universes of data and their utility is limited to some situations. I explain here the algorithm, show the logic behind code in C, in PHP and Java, the metricas, push the boundaries of the computer… and test against different sets of data looking for the big-O. I prove how much more perfomant it is and explain everything. This article is complex, is intended for very Senior Engineers at huge companies that need to handle very big data. The code is written in C to be sure that we compare everything in the same order of magnitude and to avoid optimizations from the compilers / precompilers / Just in Time engines that could bias the conclusions, and so knowing that we are playing fair, but there is a porting to PHP so everyone can understand the algorithm and there are some utilities written in PHP as well. I’ll also explain certain interesting things about PHP internal functions and how it handles memory, and other goodies about C. Finally the code is also available in Java, and is possible to observe how clearly my csort beats quicksort and how fast que JIT compiler performs. Perhaps you can be interested into reading my previous article performance of several languages. We need a huge amount of data in order to be able to demonstrate the time differences clearly. Some of the PHP tests and proves require you to have a decent computer with at least 16 GB of RAM. You can skip those or reduce the magnitude of the set of data, or simply use C.
Take this article as an intellectual entertainment, although I think you will discover this useful algorithm / technique of mine will allow you to sort much faster than quicksort in most of the cases I can imagine, and so you will have another tool in your set of resources for sorting fast and dealing with heavy data structures. To be fair and trustworthy the numbers will be generated and saved to disk, and the same set of numbers will be used for comparing between all the algorithms and tests and when checking with different languages. For this test I created an array of numeric items. I created a .txt file filled with the numbers, and then I load the same set of numbers for all the tests so all the numbers are always the same and results cannot be biased by a random set very lucky for the algorithm to sort. I’ve generated several universes of tests, that you can download. If you prefer to generate a new set of numbers, you can do it by yourselves. Please note: my computers have a lot of memory, but if you have few memory you can easily modify this program to save the values one by one and so saving memory by not having all the array in memory. Although I recommend you to generate big arrays and pass to a function while measuring the memory consumption to really understand how PHP manages passing Arrays to functions and memory. I found many Senior devs wrong about it. 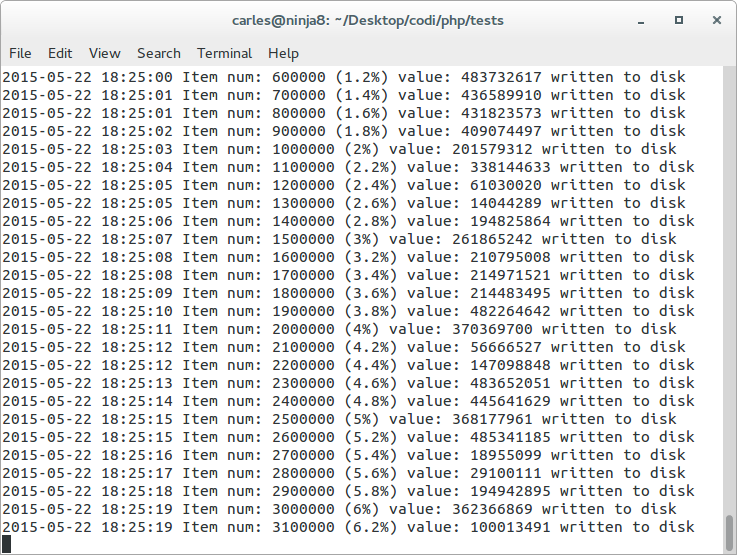 Obviously to generate an array from 50M items in PHP you need enough of RAM. In PHP this takes ~9GB, in C you need much less: just 50M * 4 bytes per item = 200 MB, although as my program is multipurpose and use several arrays you will realistic be needing >2 GB RAM. This forced conversion to int is because when PHP reads the values from the disk it reads them as String (and it puts a jump of line at the end as well). We convert to make sure we use PHP integer values. I limited the number of registers sorted in this tests to 50,000,000 because it makes PHP use 12.6GB of RAM, and my computer has 32 GB. I tried with 500,000,000 but the Linux computer started to swap like crazy and had to kill the process by ssh (yes, the keyboard and mouse were irresponsible, I had to login via ssh from another computer and kill the process). 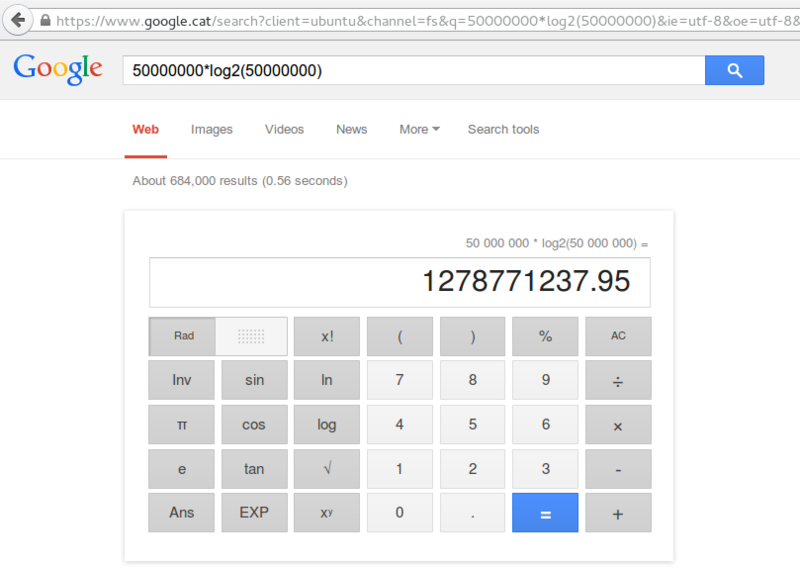 Although 500M is a reasonably number for the code in C or Java. So the fourth conclusion is that for working with big Data Structures PHP is not recommended because it uses a lot of RAM. You can use it if its flexibility brings you more value than performance and memory consumption. Everything that you do can do in PHP will be much much much faster if done in C.
I’ve developed several implementations, with several utility. This is the first case. 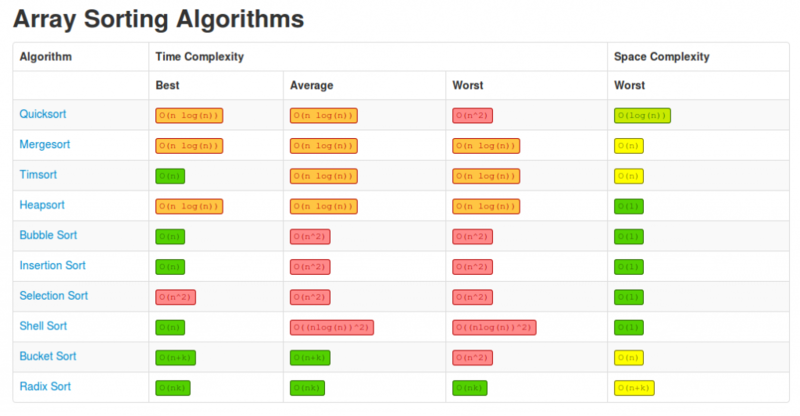 It is interesting to see the complexity of each algorithm in all the cases. So Quicksort has a complexity of O(n log(n)) for the best case, and O(n^2) for the worst. So, I copy to the destination array st_values_sorted the values, assigning the value as the index of the Array st_values_sorted. We are sure we will have no duplicates, as if the value is duplicated n times it will be simply reassigned to the same position n times, and so having only it one time as st_values_sorted[n] in the final array. We have an array, that has as index, the same value. So even, if in a foreach loop you would get the values assorted, they’re sorted by their key (hash index numeric value). An optimization is that we can also associate the index, in the process of loading the values from disk, so we save the first loop (step 1) and so we save O(n). 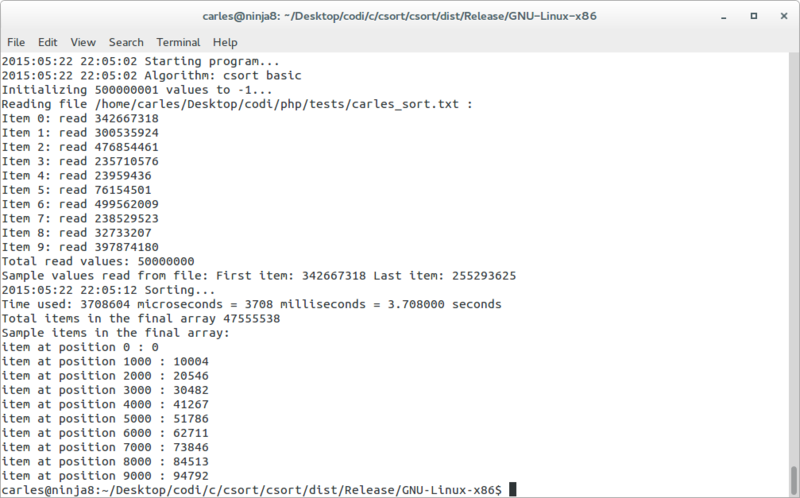 The fastest sort… is no sorting at all!. This is the recommended way of using the algorithm because it saves a lot of memory, so, instead of having and Array of 50M for loading the data to sort, and another of 1M to hold the csorted data, we will have only the 1M Array. We will be adding the data using csort and eliminating duplicates and sorting on the way. Finally, if our array is sorted (by index) there is no need to do the second loop to produce a sorted list, as the array is sorted by key. But if we need to do it, the cost is m, otherwise we have no cost at all, it was sorted and deduplicated when loaded from disk! Please note the code has been compiled with -O0 to disable optimizations for what I think is a bug I found in gcc (Ubuntu 4.8.2-19ubuntu1) 4.8.2. that manifests in the csort with compression. With the parameter -O2 the times for the sorting are half and better (0.1 seconds for csort basic, around 4.7 for quicksort). This time does not change, no matter if the random numbers were for ranges 0-1M, 0-50M or 0-500M. 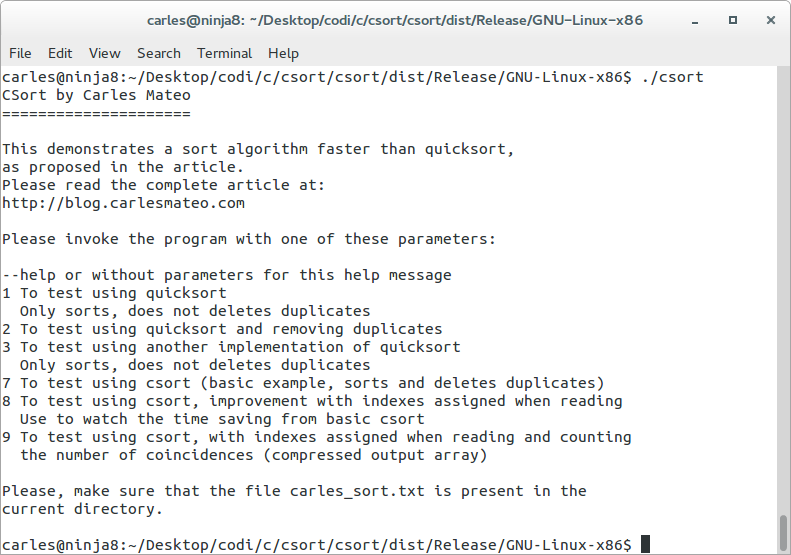 My implementation of the quicksort with removing duplicates take just a bit more as I use the same base of the csort for removing the duplicates. This is basically csort, but using the read from disk process to assign the right index, not only save CPU but a lot of memory. That way the complexity is totally reduced as data is sorted (by index) and deduplicated when loading, with no cost. In the case of the optimized read, with an universe of 50M items, ranges 0-1M, it takes the astonishing time of.. 3 ms! So 0.003 seconds. Probably this represents better the idea of beating quicksort: csort 0.003 seconds vs ~10 seconds quicksort. Image we have a numeric array with unique values, for example id, and another String array with the names. So, we will have csorted for the id, but the value will be pointed to the linked data in st_names. This can be used too with csort optimized reading and saving the use in memory of the array st_values. Obviously st_names must be kept. 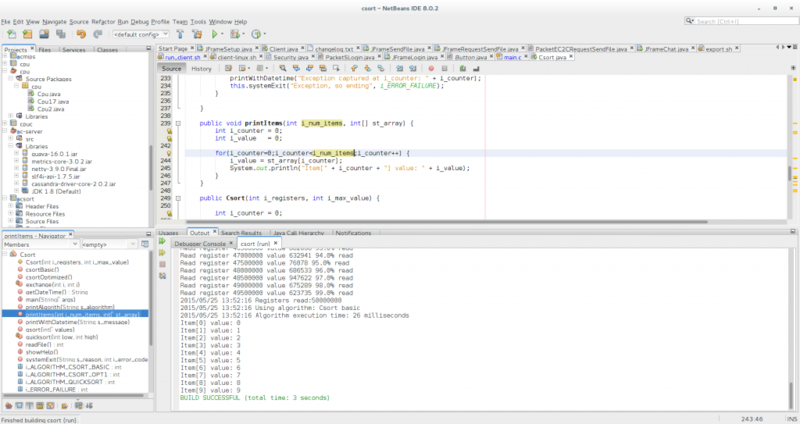 csort is very quick for sorting and removing duplicates. But what happens if we want to sort and keep the duplicates? So, it assigns the index, as the other versions of csort, but instead of assigned the same value as the index, it is assigned the number of times that this value is found. If your values repeat a lot, and you have a huge set of items to sort, like in Big Data, this algorithm is wonderful and have huge memory savings and amazing speedy random access to data. The idea, as mentioned before, is to do not load the data into an Array, and then sort, but to assigning using csort when reading data from disk. That way instead of having an Array of 50M and another of 1M, we would have only a single Array of 1M. But awesome news are that the csort with compression can be implemented on the load time, like csort opt read. Ideally min(m) and max(m) should be calculated. Imagine that you have a universe of data composed by id driver licenses. Guess that those numbers range from 140,000,000 to 190,000,000. There is no need have create an array of 190M items. Just create an array of 50M, (max(m) – min(m)) and save an overlay to a variable. Then simply do your loops from 0 to max(m) – l_overlay and when you’re building the final linked list or the sequentially ordered final array add l_overlay to each value. You will save memory and increase speed. Guess you have a hybrid universe, composed by let’s say 75% of your values in the range of 0-1M and 25% of your values being frontier values, f.e. between 35M and 900M. You can then sort the 25% with another algorithm and merge the csorted array (it goes first) and the 25% (bigger values, go later), now sorted Array, and you’ll have benefit from a 75% super-fast sorting. 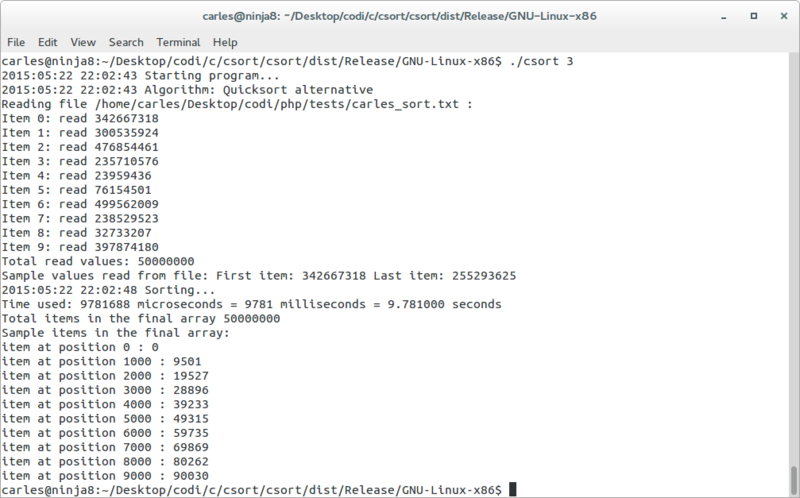 For my tests, as long as you have memory, you can csort up to n * 10, and have significant time saving respect Quicksort. So if you have a really huge universe you can implement a hybrid algorithm that sorts up to m = n * 10 (l_last_frontier = n * 10) and use another algorithm to sort the rest >m. Finally just add the sorted second block to the sorted from first block results. When you’re loading the data, and csorting using csort opt read, keep a variable with the max and min values found, so you’ll not have to parse all the 10M, just from min-max in order to generate a final sorted, deduplicated, list or array. It’s up to you to fine tune and adjust the size for the minimum memory consumption and maximum efficiency according to the nature of your data. With the progression of Big Data we are finding ourselves with seas of data. Those universe of data tend to have a much bigger number of registers (n) than the range of values (m). For example, in the case of devices monitoring temperatures every second, we will have 3,600 rows per hour, 86,400 rows per day, 31,536,000 per year while the range of values read will be a very stable subset, like from 19.0 to 24.0 C. In this example, multiplying the float value per 10 to work always with Integers, we would be working with a subset of 190-240, so m would be 51 if optimized, or 0-240 if not. If we want to get the unique temperatures for the past year, csort will generate just an Array of 51 items, crushing any ordering algorithm in space and time. The bigger the Data is, the faster csort will perform compared to other sorting algorithms. 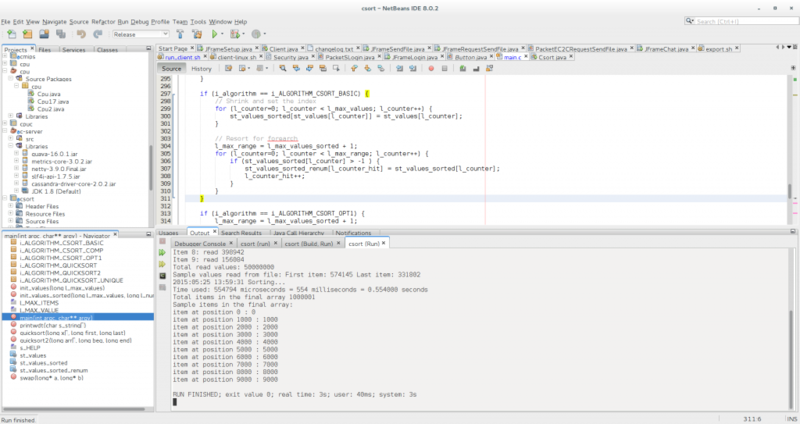 This is the complete source code. 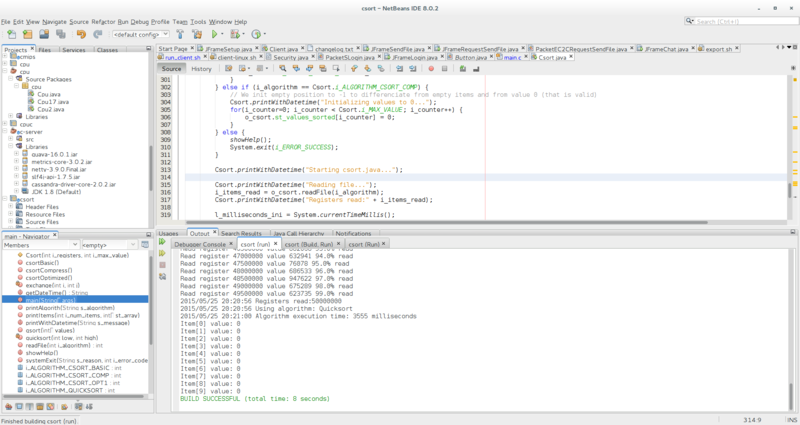 It supports all the cases and you can invoke it from command line with a parameter for the case number you want to test. // and we want to know what's the case. gettimeofday(&time, NULL); //This actually returns a struct that has microsecond precision. gettimeofday(&time_end, NULL); //This actually returns a struct that has microsecond precision. 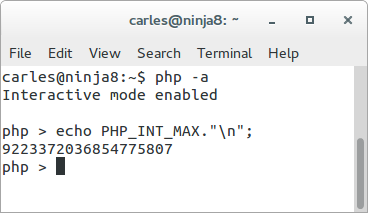 As told before I have implemented my algorithm in PHP, and it outperforms by much the PHP native functions (PHP sort() is a quicksort algorithm written in C, and unique() ). I explain everything below for the PHP lovers, is the same than in C, but with special considerations for PHP language. Even in PHP the efficiency of the algorithm is clearly demonstrated. Warning, do not attempt to run the PHP code as is in your machine unless you have at least 16 GB of RAM. If you have 8 GB RAM you should reduce the scope to avoid your computer to hang up or swap very badly. In this case we did a PHP sort(), and we didn’t even remove the duplicates and it takes 88.5 seconds. Please note that sorting and doing array_unique takes more time than doing in the opposite order. This is curious as one may thing that removing duplicates and sorting could be much faster than sorting and removing duplicates, but just sorting takes 88 seconds. 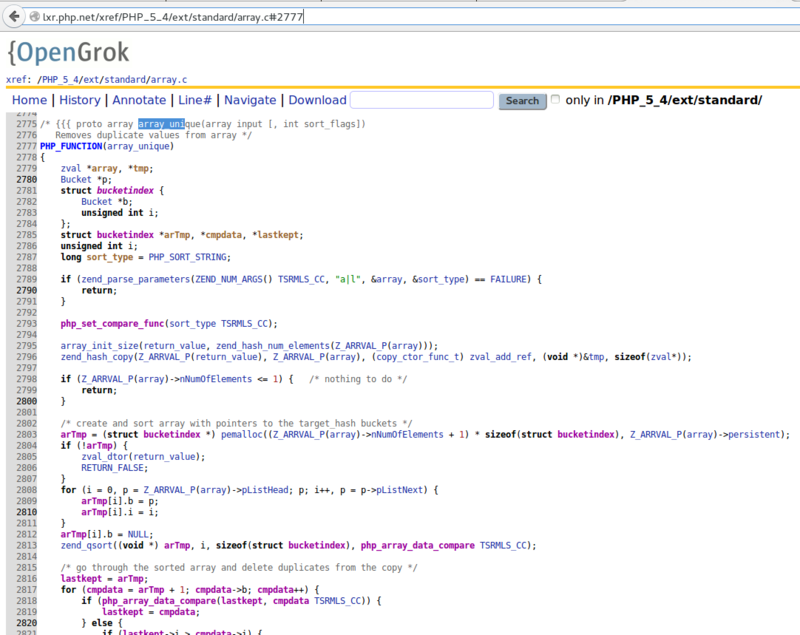 I found the explanation looking at the source Source Code of PHP array_unique. Internally it sorts the array (zend_qsort line 2813) for removing the duplicates. So well, we were sorting twice, and sorting a sorted array. This is the worst case for quicksort, so that explains the slowlyness. Then it enters what I engined. PHP works with arrays, that can have a numeric index. 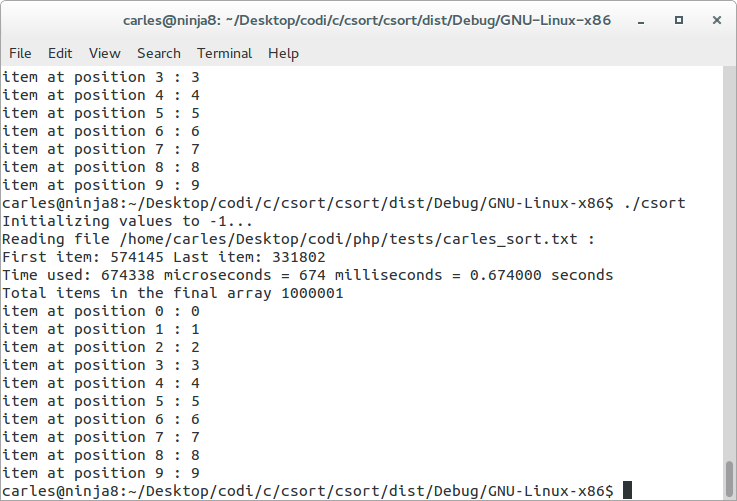 So my point is: the fastest way to sort an array is… not sorting it at all. 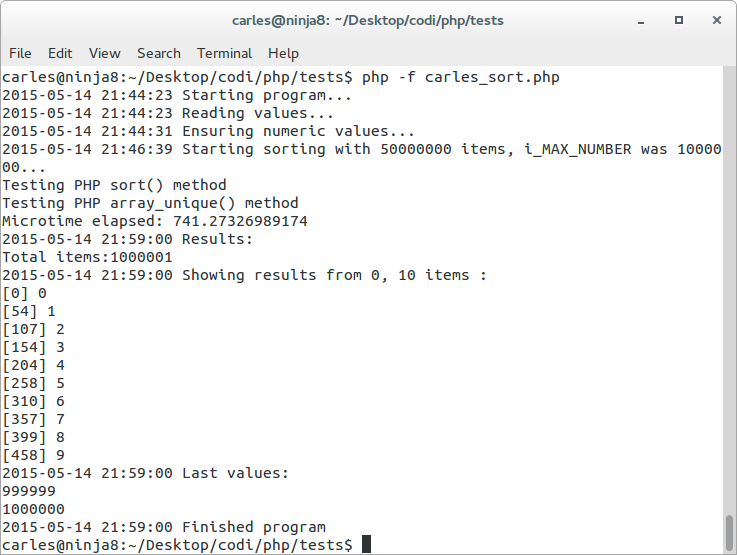 PHP sort() function is written in C, so it should be fastest than any thing we program in PHP. Should be…. really?. Knowing that the values are 0-1M and the registers are 50M, and knowing the number of operations that a quick sort will do, I figured another way to improve this. So, the only think I’m doing is looping the 50M array and in a new array $st_result_array setting the key to the same value, than the integer value. 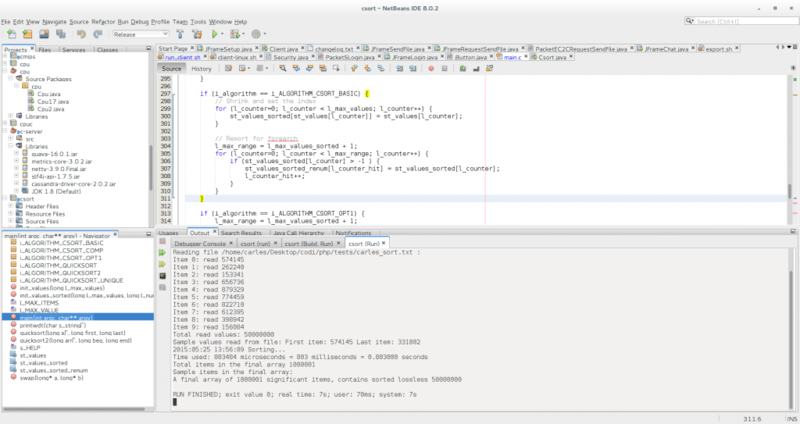 So if the original $st_test_array is equal to 574145, then I set st_result_array = 574145. Easy. You eliminate duplicates. With 50M items, with values ranged from 0 to 1M you’ll set a value many times. No problem, it will use it’s index. In this code we create a new array, with the values sorted in the sense that a foreach will return them sorted. But instead of recurring 50M registers, we only go to the max value (as values and indexes are the same, the max value also shows the max index), because we now don’t have 50M registers as we eliminated the duplicates, but 1M. And in an universe of 50M values from a range 0-1M, many are duplicates. 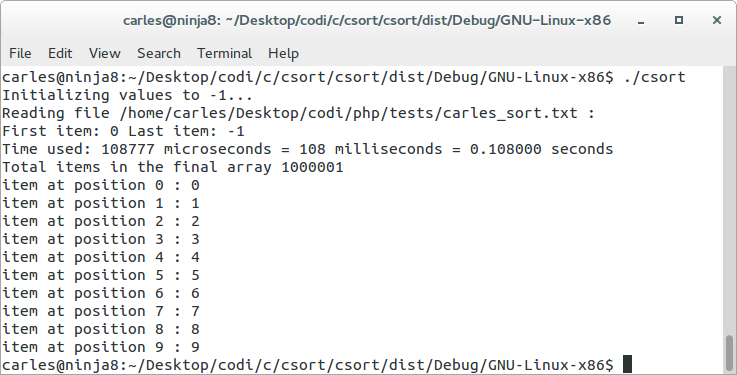 Even doing this second step still makes this sorting algorithm written in PHP, much more efficient than the quicksort written in C.
I ported the code to C, with the same data file, and it takes 0.674 seconds (674 milliseconds) and it uses only ~1 GB of RAM. So if we only resort in another array to have the values sorted eliminating the non existing values (half the tasks we do in the previous program), it takes and order of milliseconds. Now imagine you don’t want to eliminate the duplicates. Even in the case of the resulting C array, it will be much smaller than the original 50M Array, as will have only the size corresponding to the max value. In our sample 1M. In PHP you can get an Array alike the csort compressed by using a function called array_count_values(). It will not have the non existing items = 0, so it would not generate st_example = 0 neither st_example = 0, but it would generate the others. 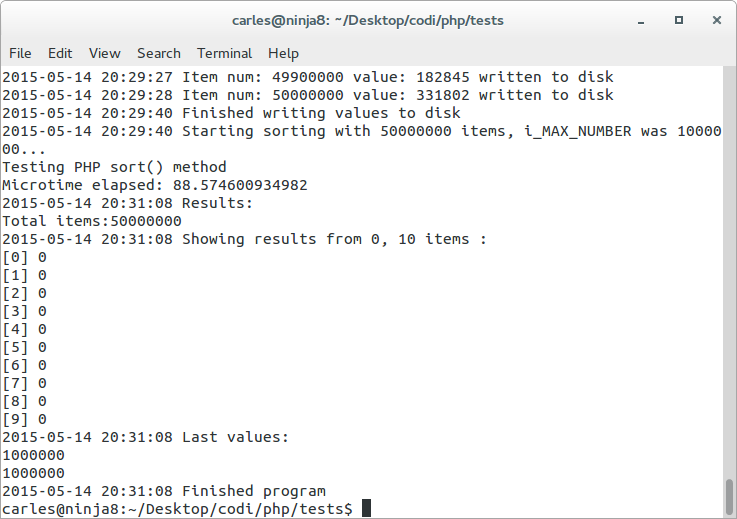 If you directly load the values form disk assigning the value as a key as well, you’ll save one loop per item (n=50M in this universe) and make it faster (having only to parse count(m), in PHP it doesn’t have to be 0-m). The fastest way to sort it, is no sorting at all. You can have the values stored per key, even if a foreach doesn’t start by 0,1,2… simply accessing the value index you need will be super-fast. as proposed in the article. Additionally I executed the csort.php in the Facebook’s Hip Hop Virtual Machine, version 3.4.0-dev, and as expected everything is much faster than with PHP standard. Must also mention that some operations like initializing the arrays, are super-fast with HHVM. 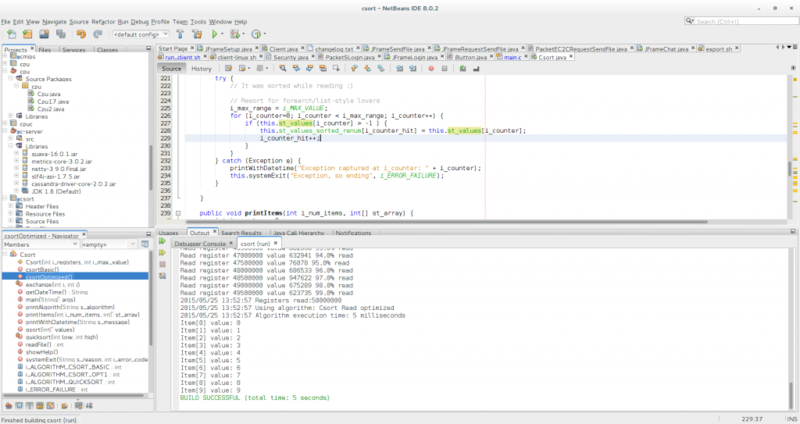 The code has been executed with Oracle’s JDK 1.7. I love Just In Time compilers. They are amazingly fast. The execution on those languages (Java and C) is so fast that it’s hard to measure accurately as any random execution of Ubuntu in background will increase a bit the time. * and published as Open Source. Note: This article is growing. I’ll be expanding the article, putting more samples, detailing timmings from different universes I’ve tested and screenshots, specially in the PHP section, to add more tricks and whys, but I wanted to put the base for being able to discuss with some colleagues. This entry was posted in Performance, Software development and tagged Algorithms, Arrays, Big Data, Big-O, C, csort, HHVM - Facebook's Hip Hop Virtual Machine, Java, JIT Compilers, PHP, Quicksort on 2015-05-25 by Carles Mateo. It all started with my best friend, and the best Engineer I know, E. H. We often meet for doing hackatons and we explore node, go, patterns, technologies… Some times we just meet and improvise a hackaton. I’ve been carrying with me a laptop, almost every single day of my life, since many years ago (that’s why I created some jokes about gym and IT and have fun with my friends, like: we IT guys go to the gym to be so strong so we can carry a laptop everywhere, all the time, without effort). But some of my friends suffer from the back, and they can’t carry weight, so they don’t bring with them the laptop unless necessary. There are some other friends, Sysadmins in the Operations field, that sometimes have alerts, so they have to carry a laptop with them when they’re on guard, but sometimes they have an alert out of guard, and nobody else can fix it and they don’t have a computer with them. I also I’m concerned about privacy and sadly most smartphone builders install crappy Software that spy the users, and send keystrokes to third party companies, etc… So having a portable device, small as a credit card, where you can type your business ideas or your thoughts with some privacy, or you can use to fix remote servers when they broke, etc… looked appealing. This also fits with my private messenger c-client. 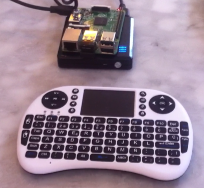 So, when I configured my raspberry 2 with OSMC and started to install Software, program crons, etc… I realized that is a tiny computer, capable enough. And then an idea came to me. What if I can make this lightweight motherboard a wearable computer?. And I started to play with this. I first needed an interesting enough OS, that I or my DevOps friends would like to use. I choose Debian Jessie for Arm (armhf). Raspberry Pi 2 uses ARM v7 that is a very important improvement respect previous Raspberry models, not only in performance, but also in the floating point. That simplifies many things and much more Software packages are available (like Snappy Ubuntu Core or Windows 10). Using Debian Jessie provided me with a very basic system that really uses few RAM memory. It uses only 65 MB RAM, with all the Wifi supported firmwares. Then I installed X-Windows, with LXDE as Desktop Manager. Everything uses only 120 MB RAM. I installed several packages, to highlight the epiphany web browser, Open Java Runtime Environment, and PHPStorm IDE. I also use Ubuntu 15.04 Desktop for ARM. 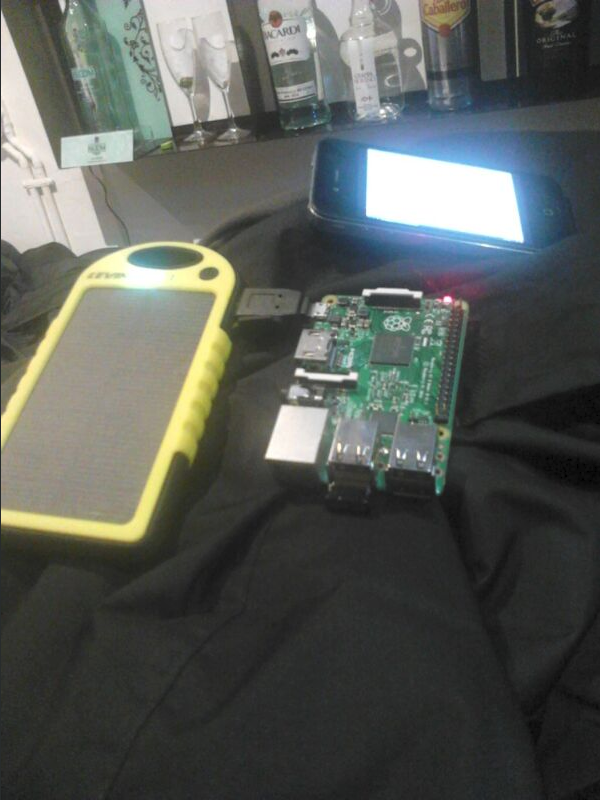 Unless Raspberry pi first generation, Raspberry Pi 2 uses micro-USB standard 5V input, like most of the Android phones. 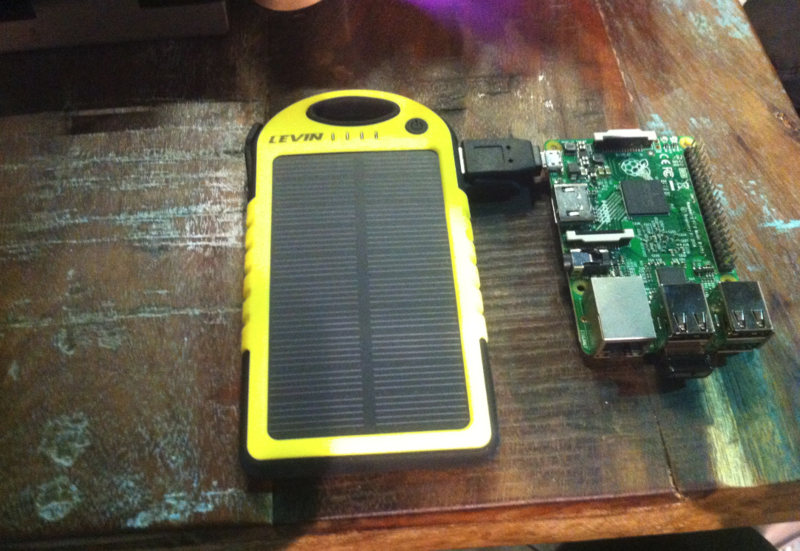 So I decided to do some tests about sustained energy input with batteries. 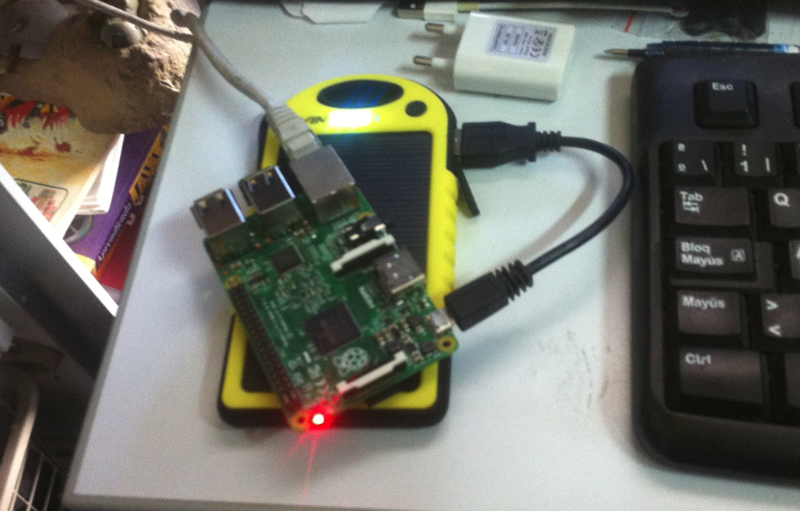 First I calculated the energy consumption of the Pi 2, plus Ethernet and plus some USB devices I would like to attach. I found that common power banks, those you use to charge your smartphone when battery is depleted and you’re on the run, bring a continuous energy signal that works perfectly well. I tested it by running the Raspberry Pi 2 for hours while reproducing video, doing live updates, flawlessly. 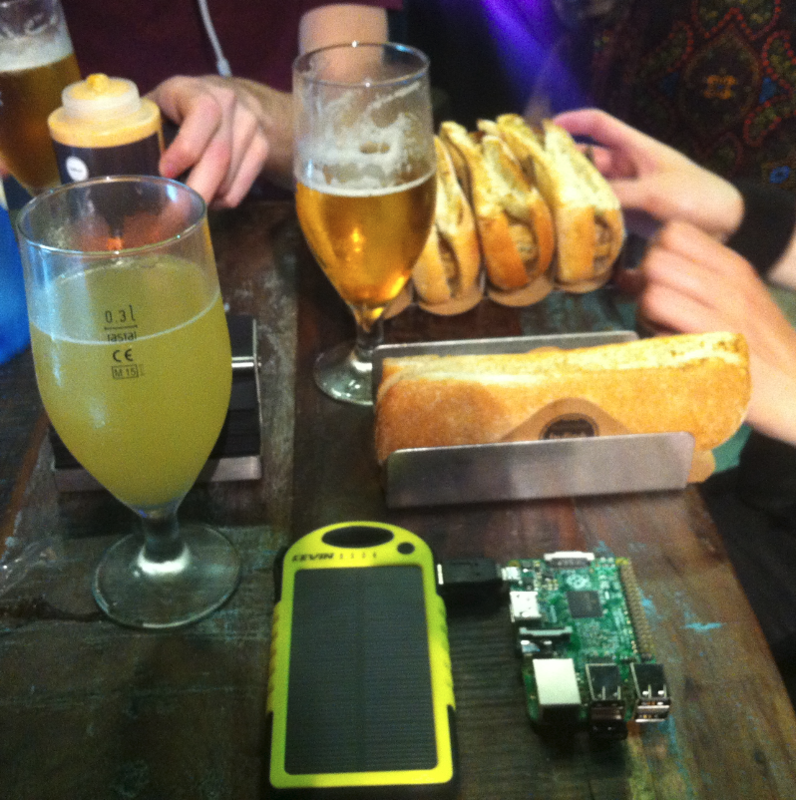 Then the first version of the Prototype C was born. It weights 160 grams/0.3527 pounds/5.64 ounces. 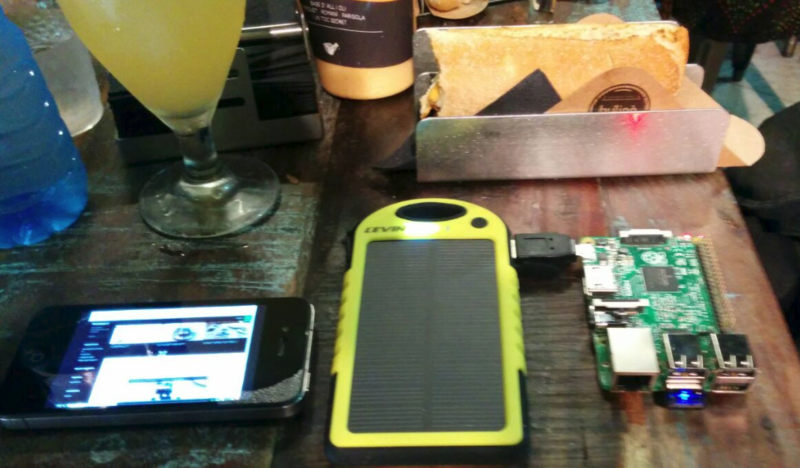 Some of the powerbanks are so cool that they allow you to charge them while at the same time they are providing energy to the output. 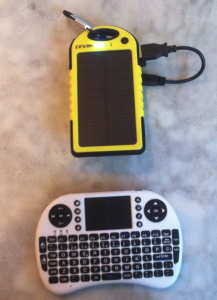 So you can have the Prototype C continuously running, and if the battery is going to deplete you can just plug it to the energy plug of a bar, and the C will continue running non-stop, and the battery will charge, so in a while you can continue your walk without stopping the C.
Later I bought a Levin solar powered battery, that is lightweight, protected to impacts and that has two outputs (1, 2 A) and charges while exposed to sun, so I can have the battery in the outside of my bag, and while I walk in the city it is being charged at a max rate of 200 mA. This is ideal for people hiking in the mountain or traveling in the world, so it can save lives if a problem comes and phone’s battery is depleted. I think also in boys in Africa or poor countries where they children have to walk a long to the school. This walking could help charging the battery so they can study at the school and continue studying at home. 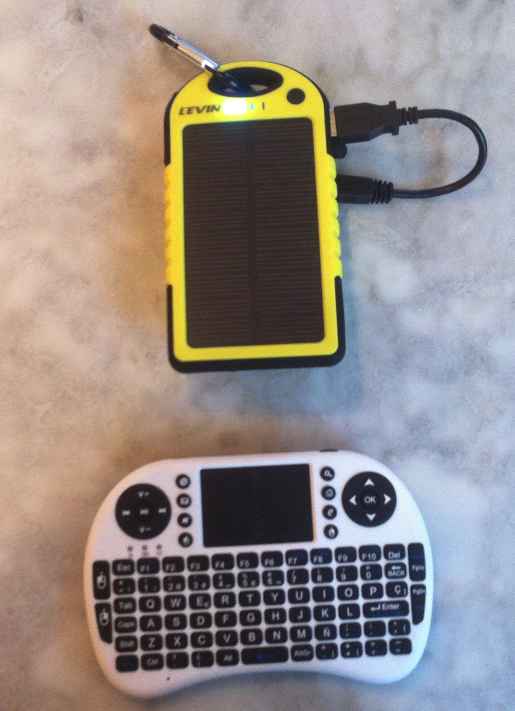 Note: This Levin solar battery doesn’t accept to be charged and to bring energy to the device at the same time. Note: you can also aliment it from the car lighter connector with and adapter. That part is not easy. Most of those monitors work for the Raspberry Pi, first gen, or for Arduino, Banana Pi, etc… but not for Raspberry Pi 2. So this is the first thing to be careful. 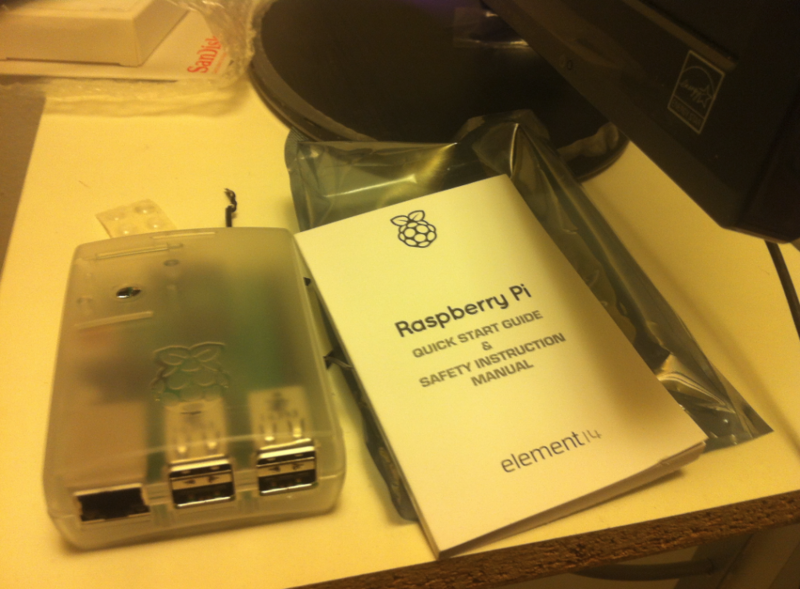 Other of those monitors get the signal from the Raspberry Pi GPIO, the General Purpose Input Output, from Raspberry. So they need some kernel patching, binaries, not Open Source code usually, and that also prevents from certain kind direct access to drawing in X not being displayed in the monitor attached via GPIO. Other monitors require external power source, often 12 V, and so are very voluminous. So they are not a fit for our means. Normally those monitors are touch screens, some take the power from the GPIO and also control the touching from there, but others require two USB: one for the energy and other for the touch controlling part. You have also to consider if they have external button to power on, power off. Also those monitors have extremely low resolution, 320×480 and like this. Only found a model supporting 800×600 and is a 5″. And finally you have to take in consideration the power consumption. 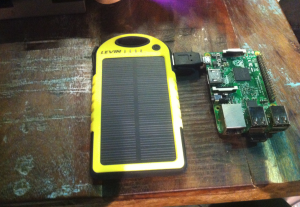 I solved this by buying power banks that have a 2 or 2.5 A output. Simple power banks provide a 1 A output, better ones provide two outputs: 1 A output for smartphones, and 2 A output, normally for tablets. Part of the cool thing is the possibility to have the monitor in a place, and the Pi and the battery in another place, like for creating wearables and other cool stuff. As I wanted to provide DIY for people, and an elegant cheap lightweight solution, the difficulty to find those monitors was a gap, so I explored several ways to use cheaper screens until I realized what is what every engineer (and common people) carries with him every day?. The smartphone. 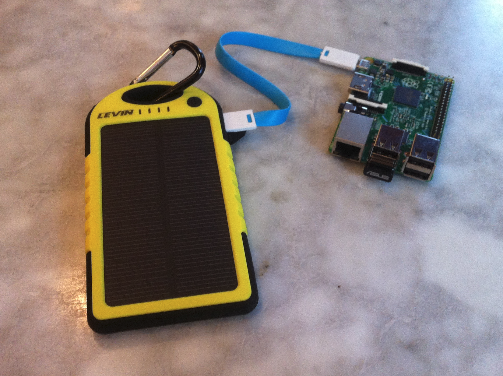 As I wanted to have Wifi I needed USB Wifi that can work with Raspberry Pi 2 and Debian Jessie. I had some problems at the beginning (caused by a bug in wcid), but I managed to make everything work. I have made it work with two different Wifi card models flawlessly: TP-Link Nano, Asus Nano USB-N10. Nothing stops you from adding two Wifi USB to the device. 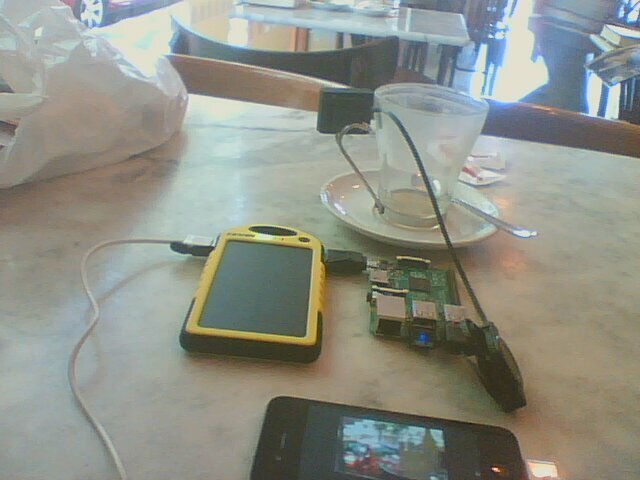 In fact is my preferred option, as I use one for being connected/controlled/display to the phone, and another for connecting to the Wifi of the place I am. That way I don’t use my mobile Data plan that much when I’m outside. In this case I recommend to use different cards (different supported chipsets) to save you headaches configuring and setting what does what (unless you like to fight with configurations until you master everything :). Some USB Wifi devices also equip Bluetooth transmission, that is very interesting for future prototypes for controlling other devices (car radio, headsets, commands..). I started to test certain things to overcome the display difficulties and finally I had cool an idea and I found a very nice option. Sharing the Internet from my iPhone creates an internal network of the type 172.20.10.x. Sharing the Internet connection from the phone, and connecting the C automatically it creates a private network, with full network visibility between the devices. 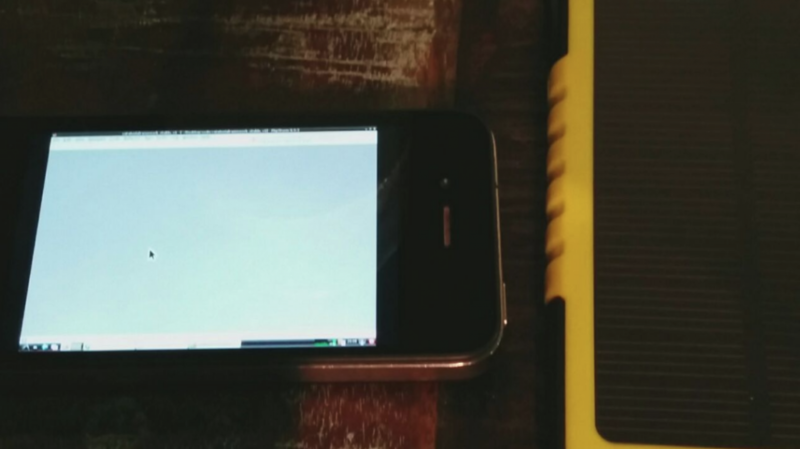 So with a ssh app for iPhone like Server Auditor I was able to connect through ssh to the C, and with a VNC Client, like Real Vnc Client, I was able to connect to the Desktop of the Prototype C, control it, send keystrokes, zoom in, zoom out. Both apps are free to download and to use. For Android it works the same, for sharing the Internet connection it creates an internal network with another range and there are also free apps for the purpose. 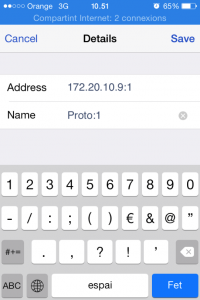 The ip assigned is normally the same, 172.20.10.9 in my case. 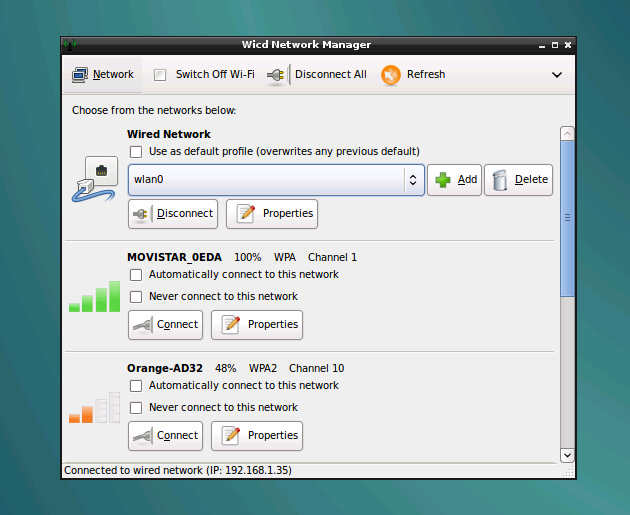 The only required thing was to setup the C to auto-connect via Wifi to my phone’s Wifi shared connection, and then connect to the C device’s ip. This is very easily done with Wcid from LXDE. I configured vnc server so I can access to the same display than the HDMI, so I can switch from working with the smartphone to HDMI easily, and I also configured vnc server through other display at a 1024×768 resolutions. 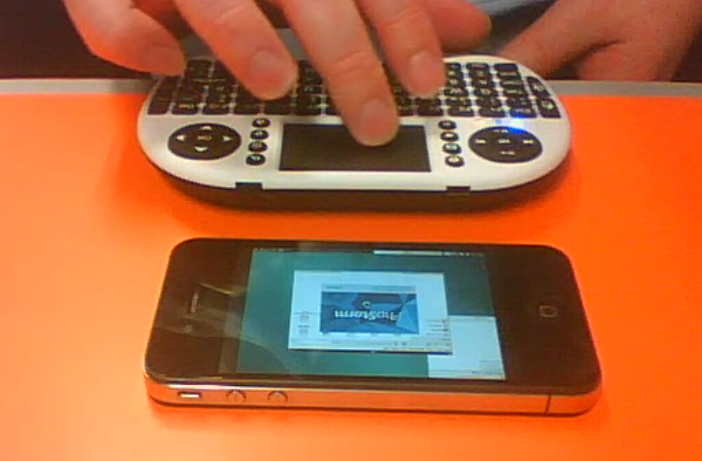 That was more comfortable to work only with the small screen of my iPhone 4. Although setting a lower resolution, like 800×600, makes it easier to work with tiny screens. 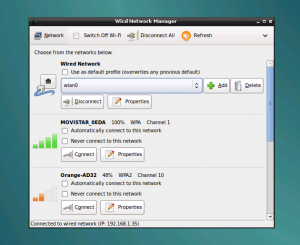 With the Vnc client you can zoom in, zoom out, with the classical gestures and use keyboard. Not only this, I allowed several of my friends to have their own independent sessions to the same C. So with only one C several Engineers can Develop or do DevOps stuff. Must say that with the Nexus and other smartphones with bigger screens, or tablets, the experience is amazing, much much better than with my tiny iPhone’s 4 screen. And of course you can control the C also from a laptop. 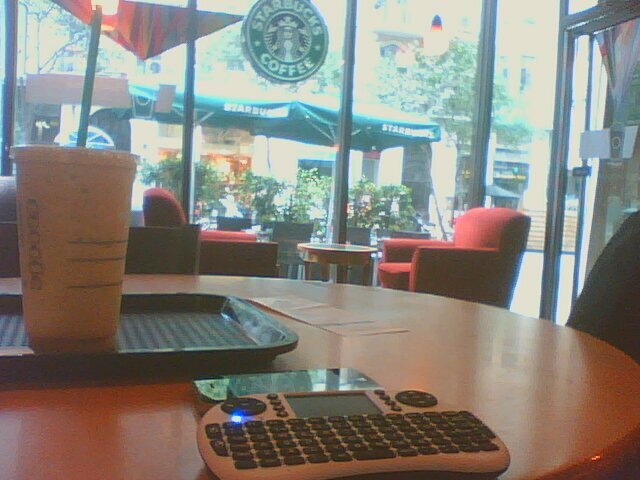 I added to the set an external bluetooth keyboard+touchpad. If you use VNC on display :0 it’s perfect, obviously external keyboard won’t work if you use different displays (as key strokes are sent only to the device and not to the different X VNC sessions, of course). With an external keyboard, the worries about spyware in the iPhone were mitigated, as all the keystrokes are on the physical external bluetooth keyboard and not on the iPhone’s screen. I used a Rii mini i8, and a Logitech. 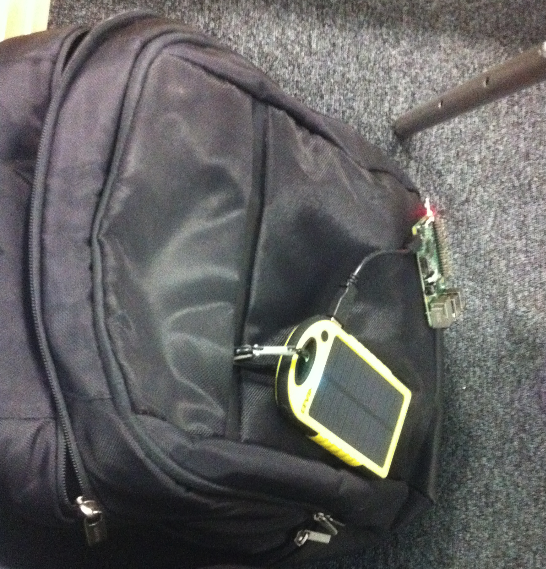 Sometimes I just connect the raw motherboard to the solar charger in the bag, and just use the smartphone over the table. No space? Do you need a sand box and have no memory for a virtual one? Honestly, I love to carry with me the raw Raspberry Pi 2 motherboard (in a cartoon box) and to connect it as is, but you can use a plastic box. It is also very useful to hang to walls, furniture, or the car. This entry was posted in Hardware, Raspberry Pi 2 and tagged Battery, DIY, LXDE, PrototypeC, RaspBerry Pi, Raspberry Pi 2, touch screen, Wearable on 2015-05-08 by Carles Mateo.